How does an employer approach becoming a ‘recovery-friendly workplace’? What does an employer have to do to become a “recovery-friendly workplace”? For Matthew S. McKenney, workforce development manager at Hypertherm in Lebanon, it is no longer automatically terminating someone in recovery when they have a relapse. However such a workplace is defined for these “early adopters,” the hope is that New Hampshire’s recovery-friendly workplace initiative will become a valuable tool, not only to help fix the opioid crisis but to alleviate the ongoing labor shortage and to help businesses increase productivity. “If you are purely about profit, this is a program for you. If you are doing something to help a state that is in a major crisis, this is a program for you. If you are an employee looking to get back into the workplace, this is a program for you. And if you are just someone who wants to support businesses doing their part, this is a program for you,” explained Gov. 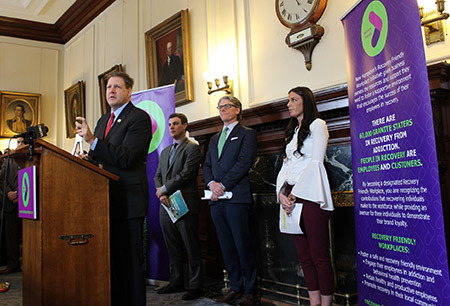 Chris Sununu at a March 27 press conference rolling out the campaign, complete with a logo and a domain name for every state in the nation, as part of the governor’s effort to bring the campaign to other states. Proponents say, just by putting a spotlight on recovery, a workplace is paving the way to help people seek the services they need. Yet the recovery-friendly workplace concept is not as new as most people assume, said Greg Williams, founder and vice president of Facing Addiction, who spoke right after Sununu. The National Council on Alcoholism and Drug Dependence pioneered recovery-friendly workplaces in 1944, he said. Indeed, the idea has been around so long that the initiative’s literature refers to “evidence-based” practices. Confusion about the initiative is one reason that a legislative attempt to fund it though business tax credits was overwhelmingly defeated in the House on April 5. To understand the paradoxes of possible solutions, we need to step back and look at the scope and complexity of the problem. There is no argument that substance abuse impacts the workplace, costing businesses $1.6 billion in impaired productivity and absenteeism, according to a 2017 study conducted by PolEcon Research in Dover. But the abuse also affects the economy in another way. New Hampshire businesses need workers, but if an employer can’t hire someone because they fail a drug test or has to fire a worker because of addiction, that shortage becomes even more acute. That is one of the reasons that employers are becoming more open to working with those who are struggling with addiction. And some of these people are desperate for support, raising the sheer size of the problem. At least a tenth of the workforce has some kind of substance abuse problem, according to conservative estimates. In New Hampshire, that’s more than 60,000 people, but only about a tenth of them are receiving services. That’s partly because there aren’t enough resources to serve them all. It’s partly because the services are short term and aren’t geared to long-term recovery. And it’s partly because they don’t seek services because of the shame and stigma involved. But the vast majority of those people — one report puts it at 70 percent — are still working. And that, according to recovery-friendly workplace proponents, means the initiative is one of the best ways to reach them. Such outreach, however, is only possible when employees know that they won’t suffer consequences — ranging from being fired to being ostracized — for coming forward to seek help. Proponents say, just by putting a spotlight on recovery, a workplace is paving the way to help people seek the services they need. Exactly what those services are isn’t as important as communicating to the employee that their company will be supportive, they say. In fact, backers of the recovery-friendly initiative providing one particular treatment program or policy could severely limit the number of employers taking part. That’s because a detailed program would be more expensive, and the type of policy initiated depends on the type of workplace involved. In addition, there are legitimate debates as to which type of recovery-friendly policy works best. There are some basic parameters for an employer to follow when becoming recovery-friendly. First, there is creating a policy, to be revisited annually, that strikes a balance between retaining and supporting someone in recovery, yet making sure their addiction doesn’t result in endangering themselves, other workers or the public. Eric Golnick, CEO of recovery-friendly early adopter Veteran and First Responder Healthcare, with Gov. Sununu. For Hypertherm, it meant changing a substance misuse agreement, sort of a contract for those caught using drugs or alcohol, to continue with the company. Previously, a violation of that agreement would mean termination. But now the contract allows room for a relapse, if a recovery coach or counselor certifies that the person is still committed to recovery. Employers will also have to train supervisors to recognize the signs of addiction, how to approach and connect with the person involved to appropriate resources. Finally, the business must also sponsor one community event dealing with substance abuse. Walmart doesn’t have a recovery-friendly workplace, under that title, said Sevinsky, who is the point man on this issue not only for the distribution center, but for all of the state’s Walmart stores. The company does have a program for employees with substance abuse issues, “but not too many people know about it,” he said. Sevinsky became aware of the issue while serving on the board of a youth group in Raymond. By talking to other early adopters of recovery-friendly policies, he is learning more about community-based services. “The playbook hasn’t been written about this yet,” he said. “We are going to write the playbook. The general vision is there. We need to nail the plan,” he said. What that playbook should entail depends on who you are talking to. For Kimberly Reid Argrew, owner of Concord-based Onsite Drug Testing of New England, it should involve some kind of random drug testing. Onsite Drug Testing got its start testing truckers according to federal Department of Transportation protocols, but now nearly 30 percent of its business comes from non-regulated entities. In 2003, when the company started, it tested 450 employees. Now the number is closer to 10,000. But several early adopters, like Grappone and Hypertherm, only test when a suspicion arises. Manchester-based Hope for NH Recovery emphasizes peer support as the least expensive way for employers to tackle the problem. “We spend a ton of money on treatment and don’t support people on the back end,” said Melissa Crews, executive director of Hope for NH Recovery. Medicaid doesn’t cover the cost of those services, so Hope for NH charges a nominal fee — $50 per employee over the course of a year. It has set up a program at AutoFair, which is owned by Crews’ husband Andy Crews, but so far the model has not been economically sustainable. Hope for NH is largely dependent on state funding, and when that dried up due to fiscal management questions, the organization ran into financial trouble, forcing it to briefly close down some centers and permanently shutting one in Concord. Coming at this complex problem from all angles might make sense, but it makes it difficult to sell to a conservative Legislature. Not that there was much of an attempt to sell it. Just hours before the governor’s high-profile press conference, an aide introduced Senate Bill 563 to the House Ways and Means Committee. The bill, which the Senate passed easily, would have given businesses a 75 percent business tax credit on donations made to recovery-friendly workplace initiatives, with a global cap of $1 million. But there were no passionate speeches in front of a crowd of supporters and the national media at the hearing. Aside from a brief statement read by the aide who took no questions, the only person to testify was Katy Easterly Martey, executive director of the NH Community Development Finance Authority, which would run the program. The CDFA runs a similar structured program, giving out $5 million in tax credits to various community groups for housing and community development projects. But the CDFA has no experience evaluating recovery-friendly workplace programs, Martey readily admitted, though she said she would seek out experts to help. Committee members were not clear about what such programs might entail. “Couldn’t you just put up free OSHA posters about drug addiction?” asked Rep. Marc Abear, R-Lebanon. Other representatives complained that the tax credit arrangement was cumbersome or “backdoor budgeting” and that any funding should instead be appropriated in the next biennial budget. In the end, the committee recommended, on a 20-0 vote, to send the bill to study, which the full House of Representatives did, via a voice vote on April 5.